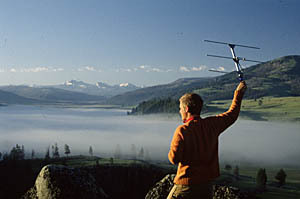 Christopher C. Wilmers tracked the wolf population in Yellowstone National Park. SANTA CRUZ, CA--Climate change could trigger "boom and bust" population cycles that make animal species more vulnerable to extinction, according to Christopher C. Wilmers, an assistant professor of environmental studies at the University of California, Santa Cruz. Understanding how environmental changes influence fluctuations in animal populations is crucial to predicting and mitigating the influence of global climate change. In a paper entitled "A Perfect Storm: The Combined Effects on Population Fluctuations of Auto-Correlated Environmental Noise, Age Structure, and Density Dependence," that appears in the May issue of The American Naturalist, Wilmers describes a powerful new mathematical model that evaluates how climate and resources interact with populations, including a fine-grained analysis of impacts on juveniles, reproducing adults, and adults. Results similar to those predicted by Wilmers's model occurred among reindeer on St. Matthew Island in the Bering Sea, where the population grew from 29 animals in 1944 to 6,000 in 1960, when a return of harsh climatic conditions caused the population to crash to about 40 animals. Similarly, on Isle Royale, where the moose and wolf populations have been monitored since 1959, the moose population increased nearly 250 percent from 1980 to 1995 (after the wolf was decimated by disease). That boom occurred during a positive phase of climate conditions on the island that ended in 1996, when unfavorable conditions caused the moose population to crash. "An unusually long sequence of good years allows a population to grow to such high densities that when a bad year comes along, the population is wiped out among all age groups, from juveniles to adults," said Wilmers. Moose, caribou, reindeer, and other hoofed species are most likely to be influenced by such changes because they live at northern latitudes where climate change effects are strongest, he noted. Similarly, herbivores are more likely to suffer than predators because their food supply responds more quickly to changes in the environment. "If global warming leads to more good years, and longer strings of good years in a row that are interrupted by the occasional bad year, we're going to see more of these violent fluctuations," he said.